When it comes to pretension, quoting yourself is one of its masturbatory peaks. Allow me to indulge in a scratch that lingers slightly too long and paraphrase what I said about Australia’s Cemetery Urn in the distant year of 2017. The band’s self-titled release showed a great deal of promise with its punishing yet coherent death metal, making them a band worth paying close attention to. While I’ve been anticipating a new release, this quick of a turnaround is worrying. Can Barbaric Retribution be the result of a productive fit of inspiration or a public jettisoning of leftovers deemed unworthy of records past? Death is reliable in our lives, but worthwhile death metal is not. Reliable too are Cemetery Urn, although fortunately not predictable. The core of Incantation remains, in the modern and updated style of Dead Congregation and Disma,which have all understood and internalized the myriad developments in extreme metal and used them to forge a sound of their own based on a legendary archetype. 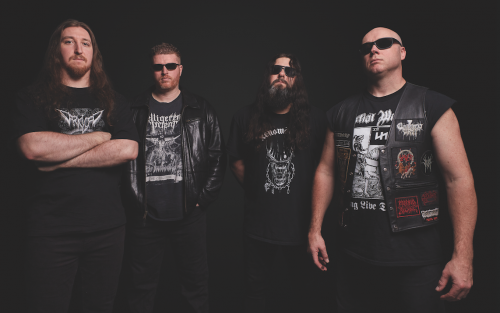 Barbaric Retribution has greater variation in tempo than its predecessor, as the band seems to have found great enjoyment in Asphyx as of late. There’s an increase in hefty chugging, but not to the detriment of genre-standard tremolo madness. An increase in melody, although without a subsequent decrease in raw brutality, has also occurred, which seems like a product of both Bolt Thrower and Asphyx influence used to good ends. The Autopsy and Immolation influences thankfully remain as well; both are utilized in a way that’s more like a paraphrase (which always bears the mark of the author’s understanding of the source material) than a direct quote. Positive developments in sound without specious or superfluous innovation, furthering Cemetery Urn’s carving of a more definitive spot in this style of extreme metal; this was exactly what I was hoping for with the follow-up to their self-titled opus. Held over from Cemetery Urn is the consistency in track-by-track quality, which renders discussion of individual highlights fairly redundant. With that in mind, there’s a lot of death metal happening here. The list of influences and muses above is far from exhaustive; the Malevolent Creation aspects of “Down the Path of Torment” are beastly, notably in the intro. Suffocation gets some high-quality nods too, notably in “Manifesto Putrefactio.” The list goes on, but you get the idea; Cemetery Urn have taken their knack for understanding death metal and applied it in a better way to their already deft songwriting than on their previous record. 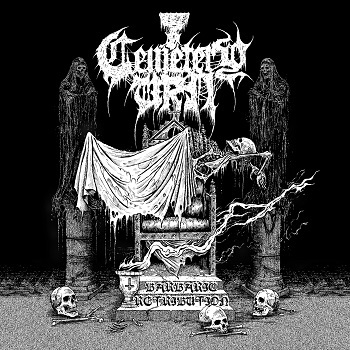 For a year without new Incantation, Cemetery Urn carries the flag proudly and convincingly. Their knack for the ebb and flow of these types of riffs, such as in the quasi-chorus of the title track, separates them from the herd that thinks “play tremolo riffs, then death-doom, then repeat” is the idea that makes Incantation, Disma, and Dead Congregation great bands. The riffs which most recall Incantation here churn, lurch, bludgeon, and pulverize in equal measure; there’s an understated variety present, one which forces the listener to pay attention instead of getting aurally mauled into bored submission by ceaseless murky sixteenth notes. Even the leads, normally a weak point in this type of death metal, are the perfect mix of chaotic aggression, learned structure, and melodic sensibility; see the end of “Victim Defiled” for a prime example. In addition to sounding great from a compositional standpoint, Barbaric Retribution sounds great in its production as well. It’s clear yet hefty, with guitars being murky and thick yet losing absolutely no detail. The bass is thick and warm, adding weight to the tremolo passages and some subtle fills to the slower sections. Drums are crisp and clear, with everything being where it should be in terms of the mix. No instance of great cymbal work — which there is no shortage of here — is lost, and no tom-abusing fill is left unheard or obscured. Vocally, there’s more of a war metal focus than last time, which takes some getting used to. S. Geoffrey employs a harsh and raspy growl-scream hybrid, but it fits the music extremely well after the initial surprise wears off. “Ghost of Suicide” has some devastating chugging and the vocals over top sound downright feral while also emphasizing the heaviness by being notably higher in pitch. It sounds simple, but this and nearly every other element of Barbaric Retribution is the work of a band who, by raw instrumental skill and songwriting chops, have struck death metal gold. Essential listening.